DETROIT — There’s plenty of mediocrity in the Eastern Conference this season, and the Detroit Pistons are taking advantage. 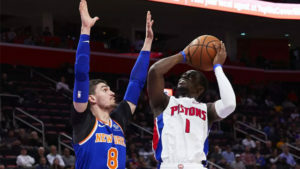 Blake Griffin scored 30 points and Stanley Johnson added 21 to lift the Pistons to a 115-108 victory over the New York Knicks on Tuesday night. The Pistons (11-7) are off to a solid start under new coach Dwane Casey. Nine of their victories — including Tuesday’s — have been against teams that currently have losing records, but they all count. “I thought we came out great, and then we hit 17 points and everything just stalled for whatever reason,” New York coach David Fizdale said. New York shot 15 of 50 in the first half and trailed by as many as 16 points in the second quarter. It was 51-43 at the half, and the Pistons stretched the lead back as high as 18 in the fourth. Detroit’s wins this season have come against Brooklyn, Chicago, Philadelphia, Cleveland (twice), Orlando, Atlanta, Toronto, Houston, Phoenix and New York. The Pistons are in a tight race with Indiana for the fourth-best record in the East. New York’s Tim Hardaway Jr. and Trey Burke and Detroit’s Glenn Robinson III were teammates on Michigan’s 2013 Final Four team. It wasn’t a great night for that trio, which combined to shoot 6 of 24 from the field. Hardaway did have 19 points and Burke scored six. Robinson had one point in 11:07 of playing time. Mitchell Robinson, New York’s 7-foot-1 rookie, fouled out with 3:27 remaining in the third quarter after having only two fouls at halftime. Noah Vonleh of the Knicks also fouled out with 2:29 to go in the fourth, and Mario Hezonja picked up his sixth foul in the final minute. Detroit went 32 of 45 on free throws and New York was 27 of 32. Knicks: New York was without F-C Kristaps Porzingis (left knee), G Courtney Lee (neck) and F Lance Thomas (left knee). … Damyean Dotson, who didn’t play at all in the previous four games, played only a few seconds in the first half Tuesday. Then he came out and scored 17 points in the second. Pistons: Detroit was missing G Luke Kennard (right shoulder). Knicks: At Philadelphia on Wednesday night. Pistons: Host Chicago on Friday night.